Bring a Valentine's Day batch to the office, place a single one on a bedside table with a love note, tuck a few into school lunch boxes...no matter how these cookies are distributed, they're sure to tickle taste buds and stir emotions. 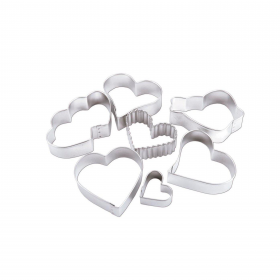 Featuring seven different takes on the heart theme, Wilton's cookie cutter set includes both straightforward and whimsical single hearts, a sweetly joined twosome, a crinkled heart, and a heart pierced with an arrow. Each metal cutter measures from 1-1/2 to 3 inches and offers exceptional definition to make sharp, clean incisions into dough. The set is best washed by hand and comes with a delicious recipe to get ideas rolling.